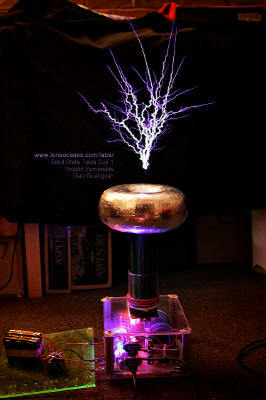 After a long hiatus building Tesla Coils, I'm back again to work on something new! 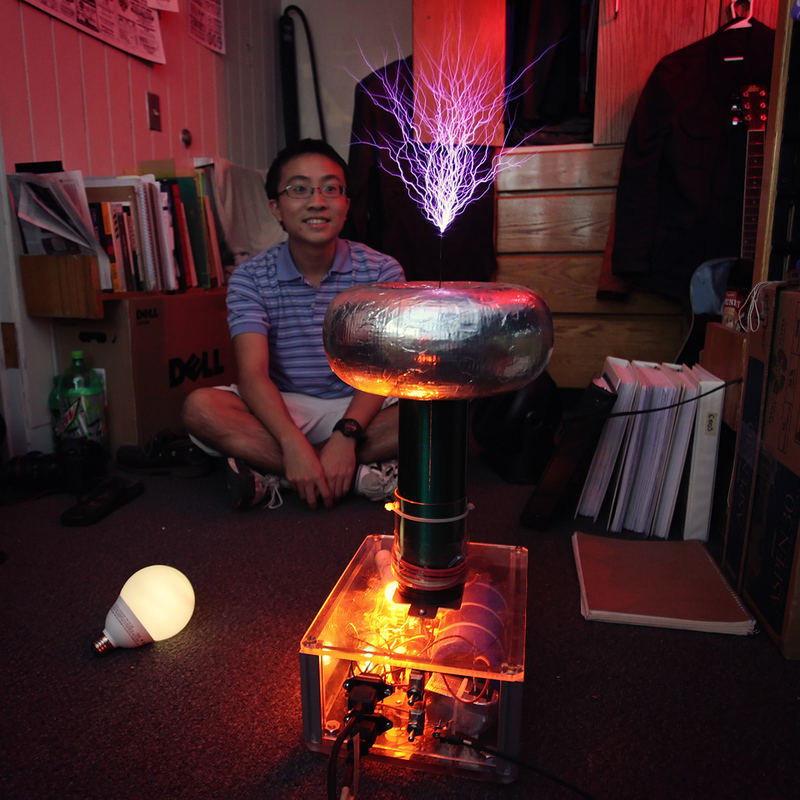 I built a few tesla coils from 2003 to 2005, including perhaps Singapore's most powerful homebuilt Tesla Coil 2. 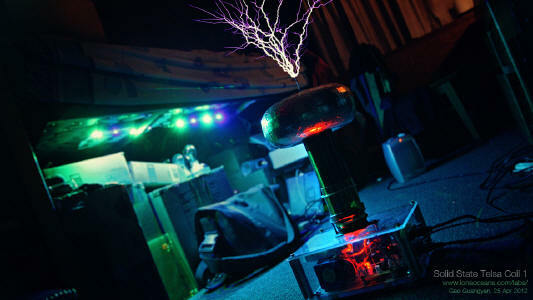 At this time, the hobbyist Tesla Coil community was ushering a new era of Tesla Coils powered by power semiconductors (instead of spark gaps). These electronic, or Solid State Tesla Coils (SSTC) were probably the first major innovation since the original spark gap Tesla Coil invented by Nikola Tesla. Only a handful of pioneers had the electrical know-how and skill to tread into unfamiliar territory. It was then when I decided to build one for myself. I came up with a design and procured components to being my first SSTC back in 2005. Yet facing heavy school commitments and a lack of time, the project was put on hold... until now. 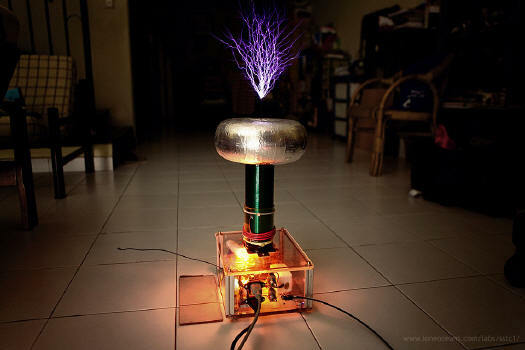 Today (2011), SSTCs have seen major innovations evolving into several variants including the popular Double Resonant Solid State Tesla Coil (DRSSTC). 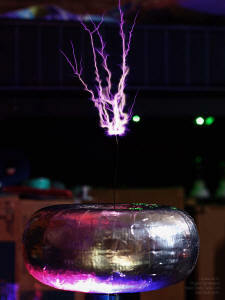 This page serves to document the design and construction of Loneoceans Lab's first Solid State Tesla Coil. I understand that the transition from Spark Gap Tesla Coils (SGTCs) to SSTCs is a fairly large jump especially for those who do not have background in electrical engineering. I hope this page (along with other pages in the future) will be able to serve as a good introductory page to the workings of an SSTC, and to show the process as to how I built my coil. At time of writing, I do not know of any other SSTC in Singapore, and may be the first of it's kind in my little sunny country! Thank you for visiting my page and if you have any questions, wish to share your projects, or feel that my projects have inspired you in one way or another, feel free to email me at loneoceans[at]gmail(dot)com. *Update* March 2012 - SSTC 1 is now complete and now plays music! While the initial goal of this project was to learn about the basic workings of a SSTC before embarking on a DRSSTC, SSTC 1 performed spectacularly and can be modulated via fiber-optic in a variety of ways, from producing sword-like spiral sparks to playing music via an analog stereo input! Solid State Tesla Coil 1 plays Harry Potter! For more videos and images of the coil in action, please scroll down to Results & Media. This story begins in 2005. 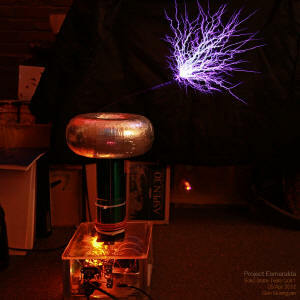 After having built several successful Spark Gap Tesla Coils, I had planned to embark on some Solid State coil work. In fact, I had already purchased all the necessary components for a simple half-bridge SSTC. I had bought a nice heat-sink, a pile of TO-247 IRFP460 500V 20A MOSFETs as well as the required logic circuitry components, and even had a nice toroid made of a styrofoam-doughnut. Unfortunately, lack of time, school commitments and other various reasons lead to the project being shelved. I'm still in school and daily work isn't getting any easier, but I now have access to a reasonably well-stocked workshop, and have since saved up a little bit of money. I decided it was time to get re-started on the project. So at the beginning of this year's academic semester in September 2011, I decided to build my first SSTC. This page serves to document the initial design goals, project construction, and ultimately characterization and documentation. This will be a small coil. Small means more portable, more manageable, and possibly cheaper. However, small does not mean weak. After reading up on SSTCs people have built over the internet, I came up with a few manageable and challenging but not overly optimistic goals for the project. I will refer to these guidelines throughout the project. 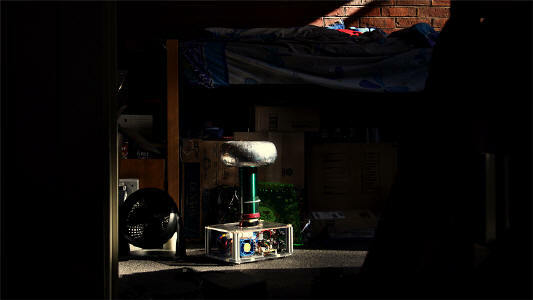 If you are building your own SSTC also, it is definitely good to figure out a list like this! - Use a 3" secondary of a winding height around 7 to 8"
For the first time, this coil will use green-enamelled magnet copper wire for the secondary. Therefore, this project will be named Project Esmeralda, a.k.a SSTC 1, to signify the emerald secondary. One interesting aspect of the coil will be the ability to run on dual line voltage, 120 or 240VAC. Also, it will feature a nice polycarbonate enclosure, and be illuminated with LEDs. The design of the SSTC can be basically split into:  The Logic Control Circuit  The Power Circuit  The Interrupter  Physical construction and others. This section explains my design choices, as well as what I have learned through the progress of this project. [Update: Upon popular request, I decided to write a reasonably comprehensive Guide to Building a SSTC for beginners, which I tried to describe the workings and design of a basic SSTC through a build-process. See my SSTC 2 page here. It covers the basic operation and electronic workings in much more detail than this page (2012) ]. 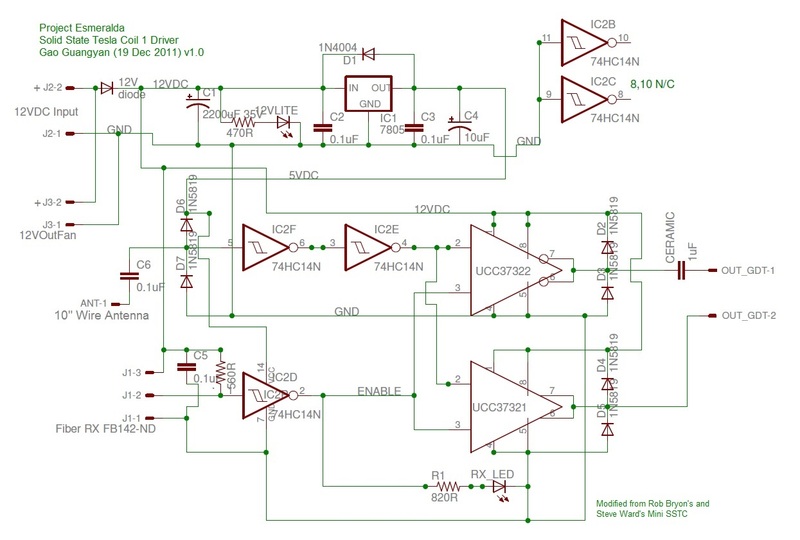 The resulting driver is very simple and compact, using only three ICs - two 9A Mosfet Drivers from Texas Instruments and one 74HC14 inverter. Let's talk about how the driver operates. There are two low-voltage rails in the circuit. 12V is provided by a regulated switch-mode DC power supply which powers the cooling fan and provides the voltage for the Mosfet gate driver chips. The 7805 IC regulates a 5V line for the rest of the logic ICs. The LED "12VLite" turns on when the power supply is switched on. The gate drive transformer which supplies the switching signals to the MOSFETs/IGBTs is driven by the UCC Mosfet Drivers. One of them is inverting. In order to prevent the entire circuit from running continuously, the circuit is enabled (turned on or off) via a signal from the interrupter (see below). The Interrupter basically sends 1-bit signals via a fiber optic cable to the Fiber Receiver FD142 (same as IF-D96F), which is an active low. When there is light in the fiber optic, the receiver outputs logic 0 to the 74HC14. The 74HC14 is an inverting chip with 6 inverters on it. It basically converts a logic 1 to a logic 0 and vice-versa, and cleans up the signal in the process. When there is no signal from in interrupter, the FD142 outputs 5V (logic 1) to the inverter (one of the inverters of the 74HC14, in the schematic, pins 1 and 2). The signal is inverted to a +5 (logic 1), which goes to the Enable gate of the UCC3732x drivers. To get some feedback so I know the circuit is running, RX_LED is connected to the same pin so it turns on when a signal is sent. When the gate drivers are enabled, a short pulse is sent by the inverting UCC, causing the coil to begin oscillating. 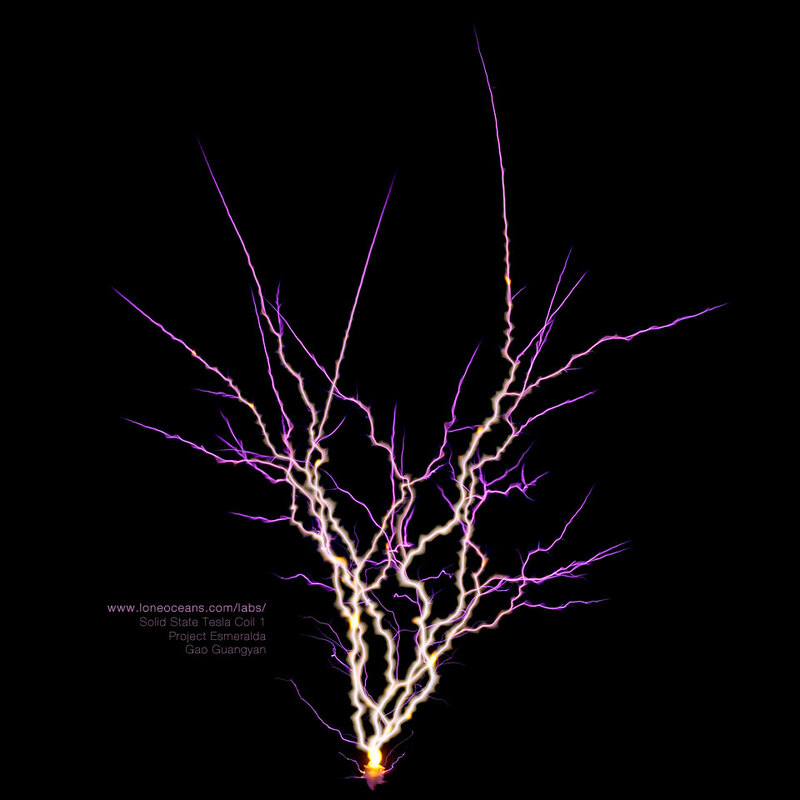 This oscillating electric field is picked up by the wire antenna (a voltage is induced in it). The oscillating signal is clamped by the 1N5819 (or also suitable 1n60 germanium) diodes which clamp the voltage to 5V and GND, and is sent as input through two inverters just to clean up the signal into nice square waves. Then it is fed into the input of the gate driver chips. Because they are an inverting pair, they work in opposition, producing a +12 to -12 = 24Vpp square wave across our Gate Drive Transformer. The Gate Drive Transformer is a small ferrite core wound by hand and is a fantastic way to isolate the gate drive signals to each of the transistors. It is important to make sure that the GDT core is of a suitable material, and can be tested by doing a test winding of two wires, one connected to a signal generator (Square wave) and the other to a scope to see the output. In this case, the two outputs of the GDT are connected in inverse across the two IGBTs, so they switch on and off correctly (in opposition). And this is how the gate driver works! 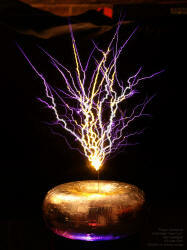 Unlike a Spark-Gap Tesla Coil (SGTC), a SSTC does not use a spark gap to switch current into the primary coil. Rather, it uses power semiconductors such as MOSEFETs (Metal Oxide Semiconductor Field Effect Transistor) and IGBTs (Insulated Gate Bipolar Transistor). Despite great advances in technology, these semiconductors still take a lot of beating in the extremely high pulse currents encountered, frequently running from a few hundred amps to a few thousand. The purpose of the logic circuit is to figure out how to switch these transistors to maximize their efficiency, reduce heating, and increasing their life-span. 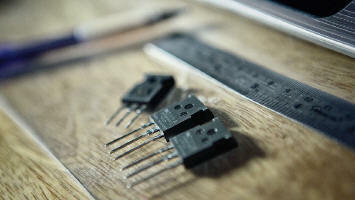 These transistors are after all, one of the most expensive and most crucial parts of any SSTC. Fortunately, a lot of hardworking and passionate tesla-coilers have tried a variety of these power transistors. In choosing the suitable transistor for my coil, I did a reasonably comprehensive search of the different transistors and evaluated their data-sheet specs, known performance, and cost. Most IGBTs and MOSFETs of these power ratings come in either the standard TO-247 (flat) package or the (popular but expensive) SOT-227 'MiniBloc' package. Often many of the same transistors come in both packages with equal ratings, but the SOT-227 package is preferred for its better heat dissipation characteristics and known 'toughness'. I decided to try a half bridge of 60N60C2D1 IGBTs to start with. This SSTC will feature two different forms of power modulation - through a basic and well established 555 interrupter circuit, and second via a ATMega microcontroller producing musical tones. I later build an analog musical controller for this coil which worked very well and receives input from a 3.5mm stereo input. One of the main goals I had set for this coil was durability and portability. The design of the coil was to be elegant and modern, and yet small enough to fit into a large backpack. Over the past few weeks, I have been gathering a list of components I plan to use, while trying to keep within my tight budget. I hope to make an order to digikey soon and get all the components at once. Most of the work has been in settling on a design for the coil. I had initially planned to use a half-bridge of IRFP-460 MOSFETs because I had some of them lying around. However, I eventually decided to work on the more robust 60n60 fairchild IGBTs. Today was a good day. In particular, I would like to thank MWS Wire Industries for kindly sponsoring 1600 feet of AWG30 Single PN-155 Green copper magnet wire for my project as a 'free sample'. Also, I cycled to the Metropolitan Pipe and Supply Company today in an attempt to find 2.5"-diameter SCH40 PVC. It seems that most hardware shops stock only 3" or 2". These are inconvenient because they have an other diameter of 3.5" and 2.5" respectively, while the 2.5" pipe has an OD of 2.875", as per my design specifications. The people there were very understanding and gave me a foot half length for no cost. With these two components, I have most of what I need to complete my secondary coil. The wire has arrived! Take a look at how beautiful it is. The quality of the wire has completely surpassed my expectations and I have to thank MWS Wire Industries. The next best I could find are on ebay. Fortunately, they are not particularly expensive. In addition, I have made an order on Digikey and hope it will arrive soon. Other people I want to thank include Bayley Wang who kindly donated a very nice full-copper heat-sink with a nice and powerful blue fan. This heat-sink will accept the two IGBT mini-bricks. The full-copper construction and powerful fan should provide equivalent cooling as a much larger static aluminium heat-sink. I also have managed to acquire a large Mallory 2500uF 450V capacitor (253J at full charge), 525V surge, as my bus capacitor. 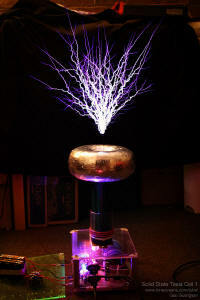 It is fairly large and places a lower-limit of my tesla-coil dimension. Looking forward to begin construction. Meanwhile, I can begin sketching up my PCB for the logic and drive circuit of my SSTC. With the wire and pipe in hand, it was time to start making the secondary coil. I've wound several secondary coils already so this one should not be any more difficult. But before I can begin winding the coil, I'll first need to make the end caps. This will serve both as an aid for winding the coil (to keep the pipe centered on a rod), and also to serve as a mounting structure. I quickly machined two end caps using some junk plastic stock lying around (I'm not sure what material it is but it seems like UHDPE) on the lathe. As you can see, part of the cap goes inside the pipe and is secured via three nylon screws. A hole directly through the centre will also accept another plastic bolt for mounting one end of the secondary coil to the enclosure and the other end to the topload. With this completed, I began winding the coil. 30AWG is not particularly thin, nor is my secondary coil very big (measuring 2.875" in diameter), so winding took just about an hour to complete. With about 8 inches of winding, that's just about 800 turns of wire. As you can see from the photographs, I taped the coil down at regular intervals as I wound it by hand. Once done, I secured the ends with one round of black electrical tape. To complete the coil, I varnished it with three layers of Polyurethane varnish. Any sort of polyurethane works well, but be sure to let each layer dry completely before applying the next layer. 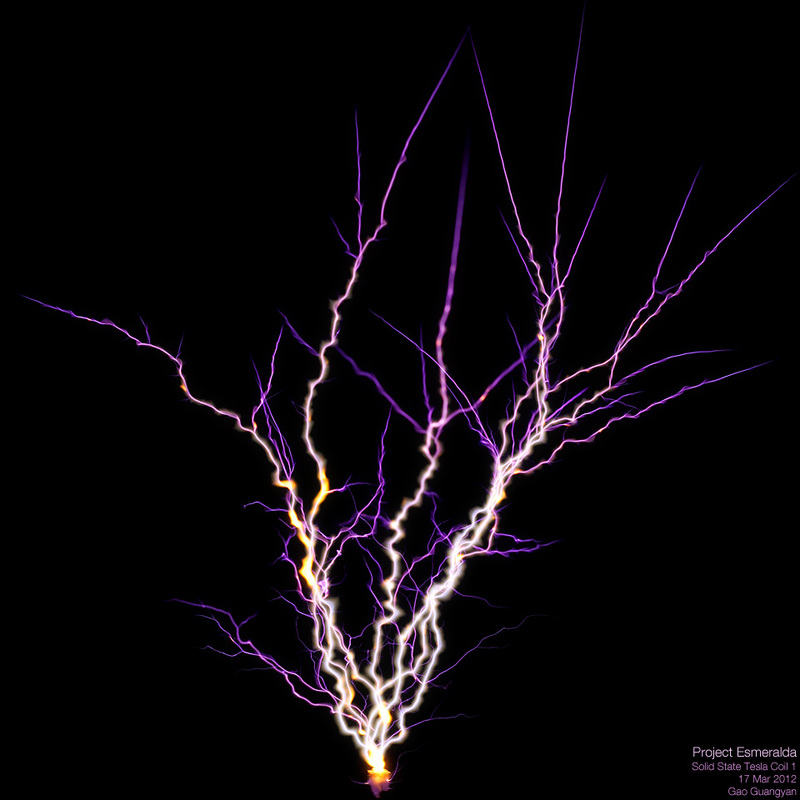 I found several thin coats to work very well in my Tesla Coils. The secondary coil is now complete! 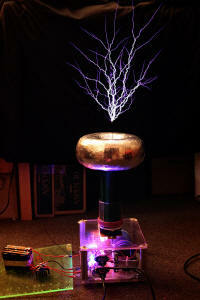 The topload of the Tesla Coil serves as a capacitor for the secondary part of the Tesla Coil circuit. 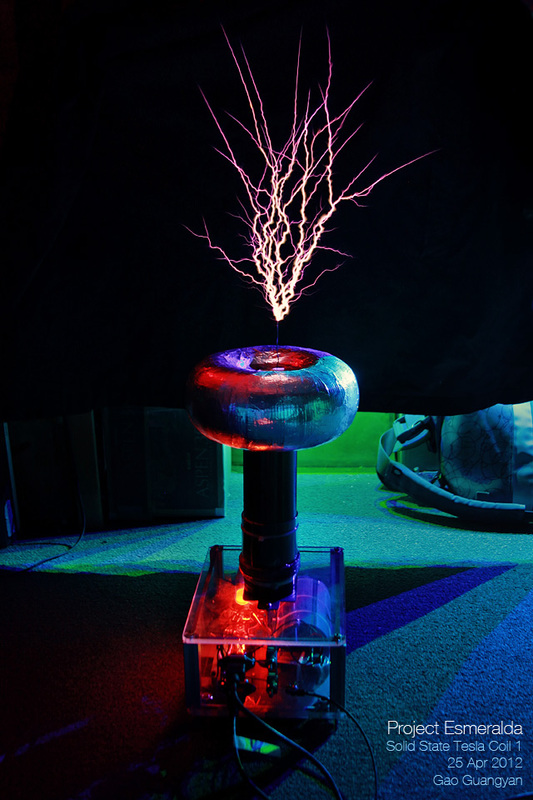 It's traditionally always been the shape of a donut for several reasons - one of which because it produces a very nice electric field around the coil making it less likely to hit the base of the Tesla Coil, and also because it looks cool. There are several ways to make the topload, including blowing up a tyre inner-tube and pasting aluminium tape over, or for more fancy coils, using a spun or stamped metal toroid. Being unable to afford a nice metal toroid, I decided to make my own. I found some nice modeling foam lying around the lab and decided to make my own foam donut. The foam was not thin enough so I glued two layers together using 3M-Spray Glue (Super 77), and cut a cylindrical block on the band-saw. I then mounted it on the lathe and spent the next half an hour carefully shaping the foam by hand using a rough metal file and sandpaper. This worked remarkably well. At this point, I should caution users that this method is potentially very dangerous so I do not recommend you trying it! After a while, I finally got the shaped I desired. The final result is nice but not perfect because I shaped it entirely by hand, but it should work. Now the foam is rather fragile and easily dented. Therefore I wrapped it with strips of duct-tape, and then covered it with aluminium tape. The tape was then rubbed smooth using a curved object resulting in a reasonably smooth toroid. The topload is now complete! The topload measures about 3" (minor) by 8" (major diameter). The interrupter is an important part of a Solid State Tesla Coil of any type (including DRSSTCs). The reason for an interrupter is simple. 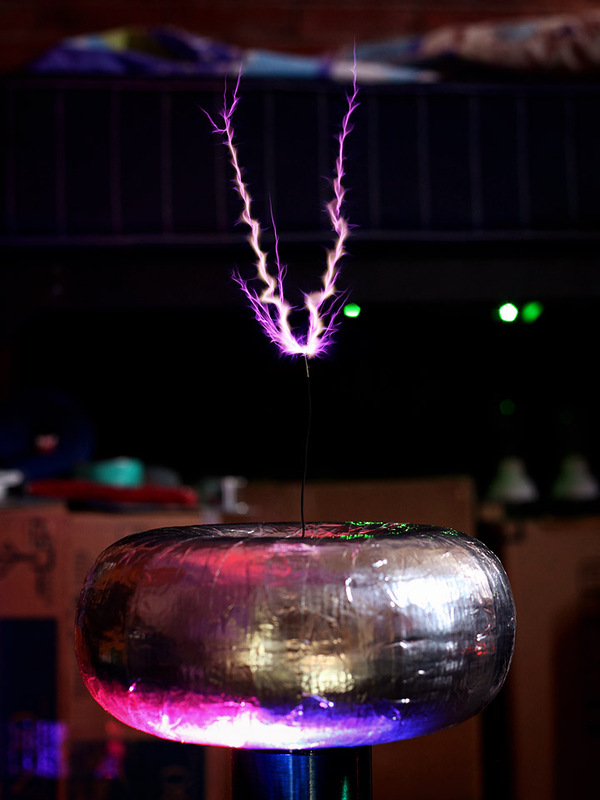 When powering the Tesla Coil, one is sending huge currents at high frequencies into the Primary Coil via the power transistors. Unfortunately, these transistors are usually simply unable to handle these large currents (especially in DRSSTCs where the currents are in the order of several hundred amps) for any extended period of time without exploding. In many SSTCs (traditional design), it is possible to run them in Continuous mode, but this places a lot of stress on the components. The interrupter is a small circuit that basically interrupts the operation of the coil. Instead of running continuously, the interrupter acts as a sort of switch to turn the drive circuitry (to the power transistors) on for a short amount of time (say several hundred micro-seconds), before turning it off (for a few miliseconds) and then turning it back on again. This allows the duty cycle of the coil to be varied from 0 to 100%. In order to make my SSTC run more reliably, I built my interrupter using a simple dual-555 circuit. The goal of this circuit is to drive a Fiber-optic LED, with adjustable on-times, and adjustable intervals (frequency). This is easily done by using one 555 timer in Astable mode (which produces a continuous stream of rectangular pulses at some frequency), which feeds into another 555 run in Mono-stable mode, which at each triggering edge of the previous 555 signal, generates an output pulse of some duration (the on-time). The frequency of the Astable 555 and the on-time of the Monostable 555 are easily adjusted by varying the associated capacitor and resistor values (e.g. using a variable resistor). In order to make the interrupter circuit nice and compact, I decided to, for the first time(! ), design and fabricate my own PCB. This turned out to be surprisingly simple to do and yielded very nice results. Here's how I made my own PCB. First, I designed the circuit in Eagle, which is perhaps the most commonly used PCB designing software in the world. This turned out to be very straightforward to use, and I was able to get my first circuit drawn up in an afternoon. Then I routed a single-sided PCB board, and printed out the traces using a laser printer onto magazine paper. It is important to use magazine paper - the kind which is somewhat glossy, very thin, and quickly turns soft when exposed to water. I then literally used a hot iron and ironed on the print (toner facing the copper side of a blank PCB board) onto the copper. The heat makes the printer toner re-bond onto the surface of the copper. In order to remove the paper, I then submerged the PCB into warm water and allowed it to soak until the paper was completely wet. Then it was simply a matter of scraping off the paper - the toner bonds surprisingly well to the surface of the copper. Finally ,the board is etched in a Ferric Chloride solution until all the copper is eaten away. The black toner is removed using Acetone. The result - a surprisingly nice home-made toner etching! It wasn't as clean as I had hoped for but I think it's not bad for a first attempt! I drilled holes carefully using a small drill press and a tiny carbide drill bit, and installed the components of the interrupter. Notice that I tinned all the tracks of the copper using solder to make it a bit more durable. Also note the use of 3-pin fan headers for connecting other components such as the 9V battery and the variable resistors. I tested the interrupter and it worked flawlessly! Success! The whole circuit board was then assembled inside a nice aluminium project box I bought from Radio-shack for $3. With the interrupter now complete, it was time to make the driver circuit which will interface with the interrupter via a plastic fiber-optic cable! This will allow me to control the operation of the coil safely at a distance with no risk of getting electrocuted since the fiber optic is entirely non-conductive. 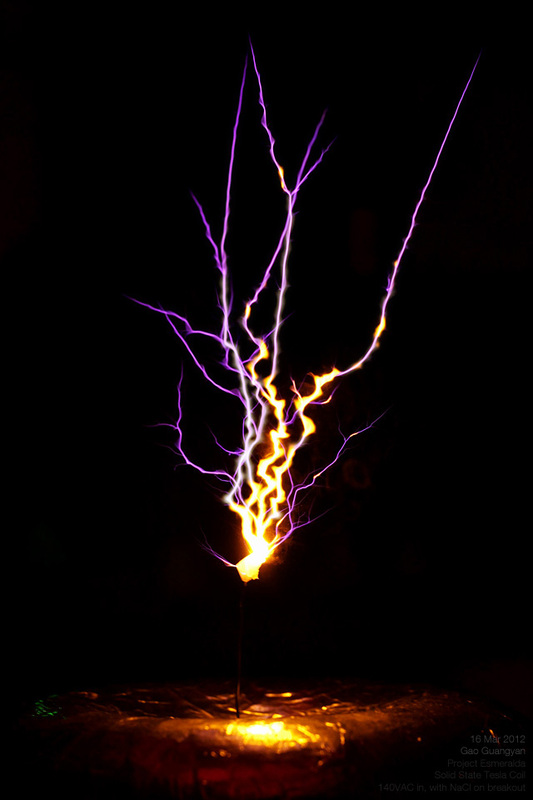 The most common circuit used in Solid State Tesla Coils for the main inverter for the primary coil is the Half Bridge - a variant of the classic H-Bridge. If you're unfamiliar with the terminology, the goal of the Half Bridge is basically to generate a voltage of +0.5Vs to -0.5Vs across our primary coil, where one end of the coil is held at 0.5Vs (between two capacitors in series), where Vs is the source voltage. One end of the load (an inductor in this case representing the primary winding) is tied to a point between two capacitors to fix it at 0.5 Vcc. The other end is switched between the +ve Vcc rail and the ground. I decided to use a Half Bridge instead of a Full Bridge to save components and to maintain simplicity. To keep the 60N60s nice and cool (and happy! ), I mounted them onto a nice solid-copper heatsink. Notice the protection diodes, TVS diodes to protect the IGBTs from spikes. A 5.1 Ohm resistor was connected to the gates of the transistor. The gates of the bridge are driven via a Gate Drive Transformer, which is controlled via the Driver Board (see next section). This is perhaps the most critical part of the operation of the SSTC - the driver, which drives the gates of the power transistors (in this case, the two 60N60 IGBTs). This design is very simple and is derived from Rob Bryon's SSTC which is based off Steve Ward's Micro SSTC. I modified the circuit slightly to suit my needs better. Having had practice making my first PCB with the interrupter, I once again decided to design and fabricate my own SSTC Driver board. After a while in Eagle trying to fit everything together and routing the traces to fit on one-side, I was done! I found another type of paper which transferred toner better than magazine paper, and used it as my paper transfer sheet instead. This turned out beautifully. As you can see, the results are very nice. As per above, I tinned the traces for durability and made sure that there were no unwanted shorts or open-circuits, and carefully installed all the components referring to a large printout I made for reference. After a busy night, the driver is complete! The driver is a simple antenna-based feedback, which goes perfectly into resonance by detecting the E-field from the primary coil. The driver uses a pair of UCC337321/22 Mosfet Drivers (good for 9A) to drive a Gate Drive Transformer at + - 12V. 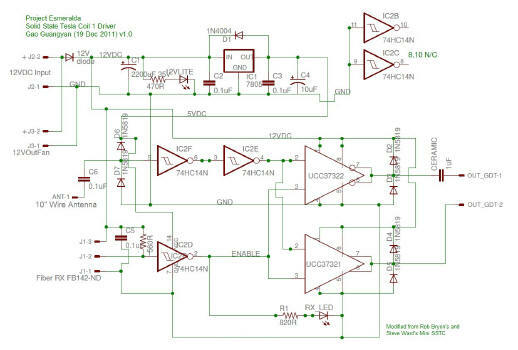 This creates a 24V peak-to-peak square wave across a 18-turn 1-1-1 gate drive core. The two secondaries of the GDT are connected in opposite to each of the IGBTs, so that one is switched off when the other is on. It is very important to make sure they turn on and off in tandem otherwise a short is created across the primary capacitor, which will lead to an exploded half bridge! 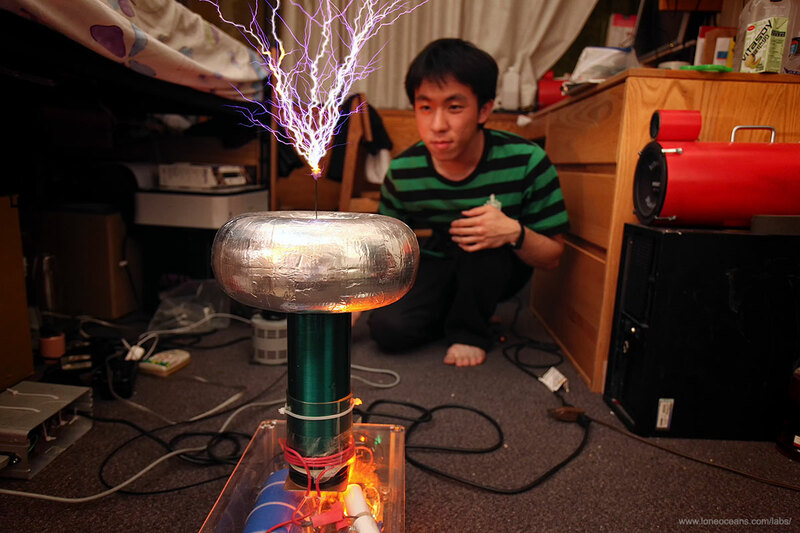 With all the parts of the Tesla Coil complete, it's time to put it all together. I decided to make the coil durable enough to be transported back to Singapore, which meant it being tough enough to withstand being tossed around in a luggage bag. Therefore, I built the enclosure out of some nice Acrylic sheets I had lying around and four aluminium columns. The case is held together via four threaded rods. 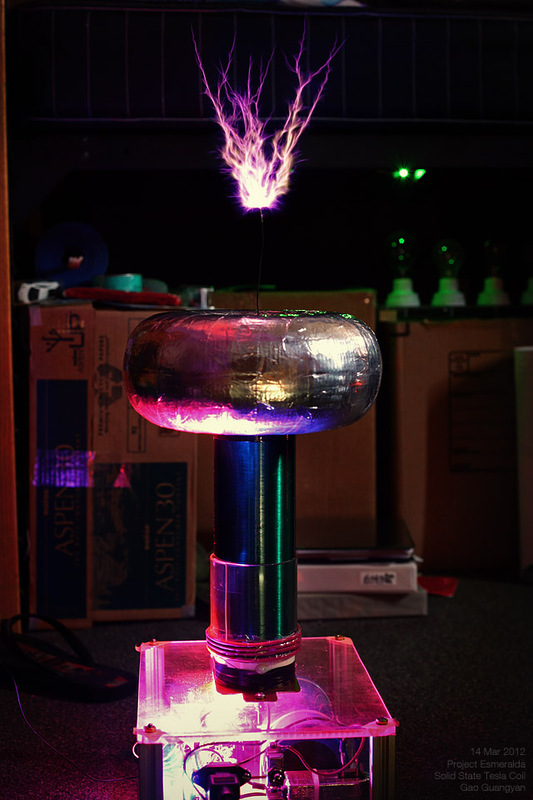 I also made the footprint of the tesla coil exactly the size of a sheet of Letter paper, so the footprint measures 8.5x11". This fits all the components comfortably! Above are photographs of the completed Tesla Coil. The primary coil comprises of 4 turns of multi-stranded AWG12 wire wrapped directly onto the secondary coil. A thick layer of soft PVC sheeting insulates the primary from the secondary. Also note the integrated 12V power supply the blue fan which cools the head-sink, and the large bridge rectifier which supplies directly to the large blue bus capacitor. 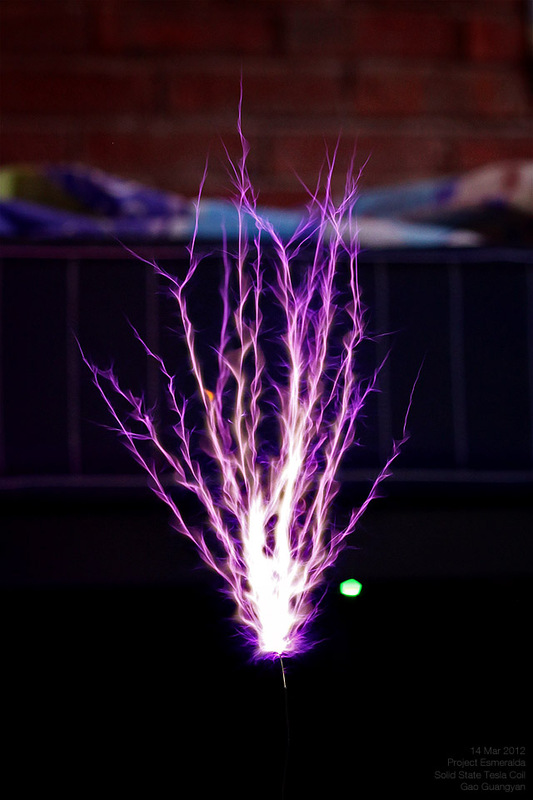 The tesla coil accepts two IEC power cords -one for the 12V power supply and the other for the bus, as well as two switches, and a fiber optic receiver which connects to the driver. 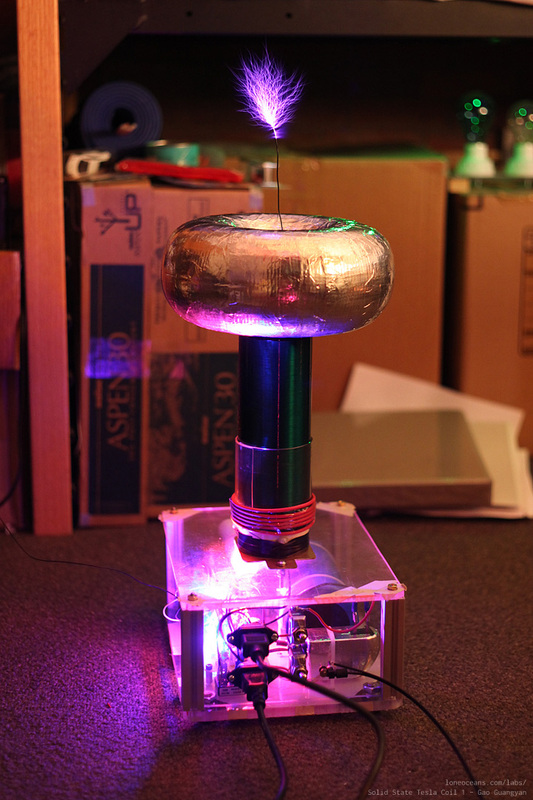 With this, my first Solid State Tesla Coils is now complete! But will it work? Stay tuned to find out! Project Esmerala - SSTC 1 is now complete! First light! After several months in the making, it's time to see if the coil will work or not! I plugged the coil into a variac and slow turned up the voltage to about 40V, which the coil should begin producing some visible sparks. I set the interrupter to the lowest frequency and turned up the pulse-width to about 200us - and sparks appeared! I realized that my interrupter was not configured well with a normal SSTC operation, which will do better with a pulse width of a few mili-seconds instead of micro-seconds, so it's time to adjust the interrupter. This is easily done by changing the capacitor of the Monostable 555. Above shows the coil working at about 200us on-time per spark at about 170VDC on the bus. SSTC 1 is alive! It's Pi Day today! It could not be a better day to test SSTC 1. My original interrupter was set with a duty cycle that was too small, which isn't the best configuration for a normal SSTC. I didn't have any capacitors at hand to change the 555 interrupter circuit. However, since the SSTC is optically triggered, I found that flashing a light through the fiber-optic yielded excellent results. Note that this cannot be done with a DRSSTC - only for SSTCs which are capable of continuous operation (usually referred to as CW or continuous wave). The above photo show the coil in action at 120VAC input. Note the very hot, fat sparks with a very curious spiral / corkscrew formation. It's a fascinating shape! I modified the interrupter to achieve good performance with SSTC 1, by adjusting the circuit to allow for pulse widths around 1.5ms. Above shows the coil running at 120VAC input with the longer pulse widths. This allows sufficient time for power to be transferred from the primary to secondary circuit. 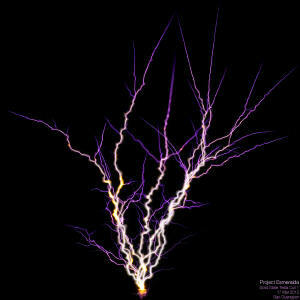 A bit of salt was added to the breakout point which lends a yellow colouration to the sparks as the sodium ionizes and glows. I'm currently working on a voltage doubler to bring almost 400VDC to the bus - what the coil was originally designed to handle! Video showing the workings and operation of SSTC 1. The results are spectacular, and more than I could ask for. The coil performed admirably and reliably. I achieved about a maximum of 19" spark to air (about 48cm), which I am very pleased with considering the 8" secondary coil length. This is almost 2.5x secondary length to spark length performance! 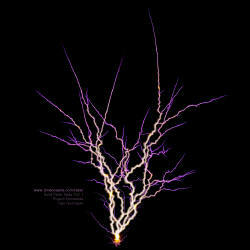 A bit of salt can be added at the tip of the breakout point (see 3rd image above) which gives a mesmerizing yellow colouration to parts of the sparks. Very cool. Above is a video showing the coil in action! Notice how the duty cycle and beats per second can be adjusted via the interrupter. The voltage doubler box sits exposed outside and I do not recommend this being done. I plan to put the doubler inside a grounded metal case very soon. I installed new blue and green LEDs under my bed (they are of course wired up to dance with music - see my LED lighting project here! ), and thought it would make a fancy background for the coil. I also made a few small changes to the coil, such as changing the LEDs at the bottom to a less bright orange one (so it doesn't saturate photographs). I also enclosed the voltage doubler in a separate box so everything is less of a safety hazard now! I also tried changing the breakout point by adding a very long wire. Mysteriously, the spark length shortened significantly, but the results are good nonetheless! Very happy with how my coil is running. My good friend Jonathan came to visit today! We fired up the Tesla Coil and it performed admirably. Here's a photograph (left) of Joanathan and the coil running at 120VAC and lighting up a fluorescent bulb wirelessly, just as Nikola Tesla had intended it to be! :) The photo on the right is me operating the coil from Jonathan's point of view! The photograph above shows the coil in my room in school before it was packed up and shipped to Singapore. A few changes will be required (e.g. changing the 12V Power Supply to one that runs on 240VAC) before the coil is operational again. *Update! * Solid State Tesla Coil 1 has been brought back to Singapore and now lives here permanently with 240VAC without a pesky voltage doubler box! The coil has received some small adjustments since, and now runs on a halfbridge of IXGH 60N60C2ND 75A 600V IGBTs in TO247-like package, and I've also replaced the capacitor with a more reasonable and smaller array of four Nippon Chemicon 400V 470uF capacitors in series. It now runs directly off 240VAC mains for about 380VDC on the bus with the same excellent performance as before. The 12V power supply has been replaced with a small iron-transformer power supply. The above photographs show the details of SSTC1 and compared to the newly improved Tesla Coil 2. It's now time to progress to DRSSTCs! After taking into account insulation thickness of the windings, I should have closer to 730 turns of wire on the 8" winding length. With a 2.875" diameter secondary and a toroid measuring 3 x 8", this puts the secondary resonant frequency around 465kHz or so. This high frequency is not ideal for the IGBTs and in hindsight, I should have made a lower-frequency setup. 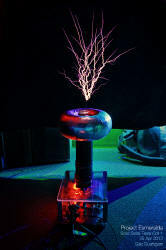 However, the high frequency probably contributed to the sword-like sparks of the coil, and the big toroid helped in increasing the brightness and power of the sparks. Here are some nice and very useful web pages.